On the banks of the Moselle, at the heart of ca. 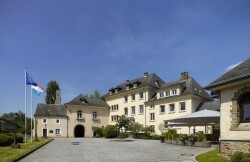 800 hectares of vineyards surrounding the Chateau de Stadtbredimus, the former home of the famous Luxembourg poet Edmond de la Fontaine is now the headquarters of Domaines Vinsmoselle. Vinsmoselle encompasses the traditional wineries of Greiveldange, Grevenmacher, Remerschen, Stadtbredimus and Wellenstein without forgetting the POLL-FABAIRE Crémant Development Centre in Wormeldange. With more than 300 winemakers, Domaine Vinsmoselle, Luxembourg wine market leaders, enjoys the diversity of the soils in the Moselle Valley to produced rich and varied wines with distinct flavour.